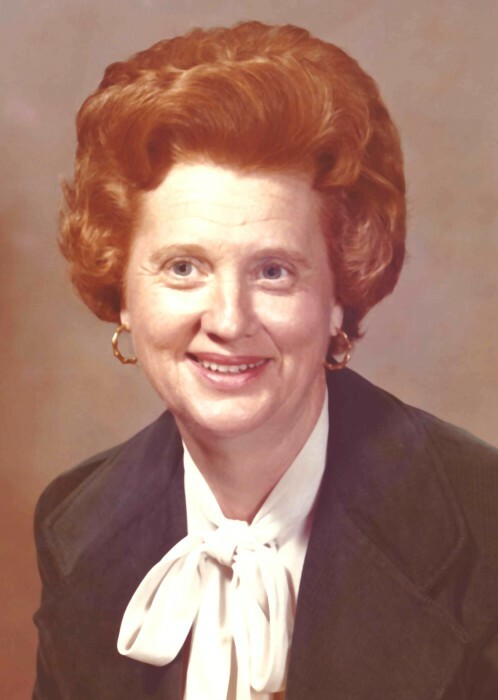 Barbara Ann Lewis Young, 91, passed away on January 14, 2019, at Westminster Canterbury in Richmond, VA.
Born May 26, 1927 in Onancock, on the Eastern Shore of Virginia, she was the daughter of the late Garland Wesley Lewis and Lella Waters Drummond Lewis, and devoted wife of the late Revelle Monds “Pete” Young for 63 years. She is survived by her two daughters, Suzanne Young Hiller and husband Doug of Charlottesville, Va., and Deborah Young Harless and husband David, of Manakin-Sabot, Va.; seven grandchildren, Sarah Fenn (and husband Joel), Carolyn Jenkins (and husband Joe), Taylor Harless, Emily Hiller, Jordan Harless (and wife Veronica), Kenzie DeAlto (and husband Jesse) and Ann Warren Harless; great-grandchildren, Miles and Hannah Jenkins, Frances Harless and Corrie DeAlto; a niece, JoAnn Young Payne; and a nephew, Mark Lewis Thomas. In addition to her husband and parents, Barbara was pre-deceased by her sister, Jane Lewis Hoppe. After graduating from Onancock High School, Barbara attended Westhampton College for one year before transferring to Radford College, when it was the Women’s Division of V.P.I. She earned her bachelor’s degree in business education in 1948, soon after meeting Pete, a V.P.I. student and former cadet who had recently returned from active service in Germany during WWII. They married in 1951 and settled in Richmond where they raised their daughters. Barbara taught school for over 30 years and served as an administrator at Tuckahoe Middle School before retiring from Henrico County Public Schools in 1990. She was a dedicated educator and is often remembered by former students as their inspiration for becoming teachers. After retirement, she and Pete returned to their beloved Eastern Shore to enjoy life on the water and visits from children and grandchildren at home, as well as in Florida and the Outer Banks. Barbara shared Pete’s passion for Virginia Tech and eagerly traversed the state with delicious tailgate provisions to share with family and friends. She was an active member of the Eastern Shore Virginia Tech Alumni Association, often hosting events for the scholarship fund. An avid knitter, starting as a teenager making socks for the Red Cross during WWII, Barbara delighted in creating handwork in many forms through sewing, basket weaving, needlepointing and more. She was a member of The Embroiderers’ Guild of America Accawmacke Chapter, skilled in most forms of needle arts with multiple projects always in progress. She was also an excellent cook and loved reading and collecting cookbooks. Barbara was an active member of Belle Haven Presbyterian Church, serving in many roles including Clerk of Session, and was an Honorary Life Member of Presbyterian Women of the Presbyterian Church (U.S.A.). 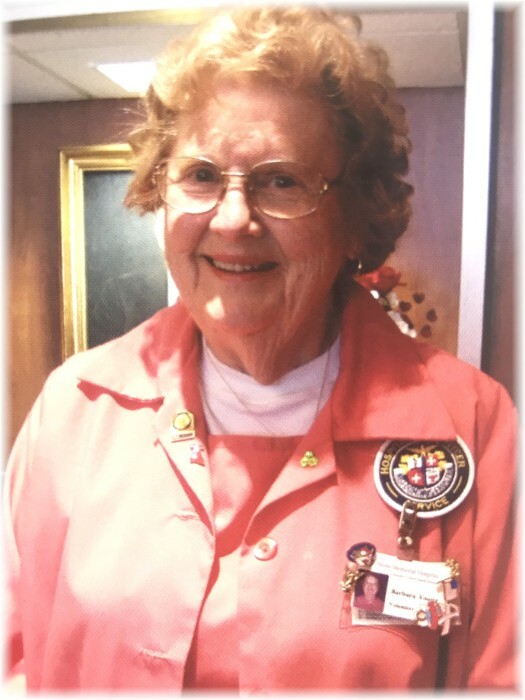 She was a dedicated, weekly volunteer at Shore Memorial Hospital for many years until she could no longer walk at age 85. The family is grateful for the loving caregivers who took extraordinary care of Barbara at her home on the Eastern Shore and during her recent two years at Westminster Canterbury. A Memorial Service and Celebration of Barbara’s life will be held in the Cochrane Commons at Westminster Canterbury, 1600 Westbrook Avenue, Richmond, VA on Monday, February 4, 2019 at 3:00 p.m.
A service will also be held on the Eastern Shore, Saturday, May 18, 2019 at 1:00 p.m., at the Williams-Onancock Funeral Home, 94 Market Street, Onancock, VA 23417. Private urn interment for both Barbara and her husband Pete, will take place on the campus of his beloved alma mater and a place they both dearly treasured, at the Virginia Tech Columbarium, Blacksburg, VA.
Memorial donations may be made to the Westminster Canterbury Foundation Fellowship Fund, 1600 Westbrook Avenue, Richmond, VA 23227, or Eastern Shore Rural Health (Memo: Eastville Capital Campaign), 20280 Market Street, Onancock, VA 23417. There's still time to send flowers to the Celebration of Life at the Williams-Onancock Funeral Home at 1:00 PM on May 18, 2019.